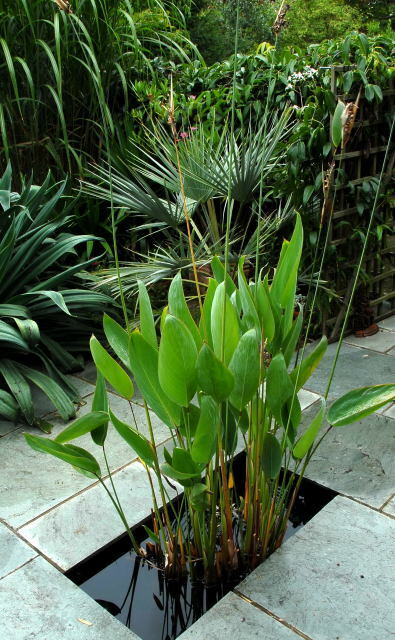 Thalia dealbata is a vigorous tropicalesque aquatic plant. 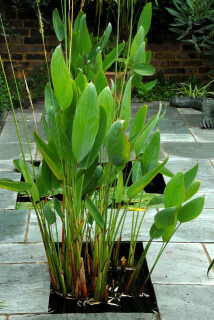 It can be planted in the pond, swamp pot or the bog garden. It comes with the added bonus that it is hardy enough to be left out all year in Zone 9 (at least). The pot shown in the picture below has frozen solid on several occasions. Like most aquatic plants, Thalia dealbata is happiest submerged in water and growing in full sun. 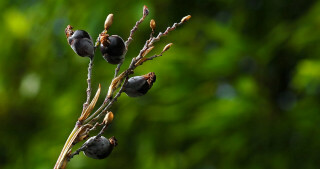 During the day the plant holds its leaves more or less horizontally but in the evening the leaves all stand to attention in an upright position. Thalia dealbata seen growing in a swamp pot and growing in the pond. The small palm to the rear is Brahea armata which died as a result of the winters of 09/10 and 10/11. Beschorneria yuccoides grows to the left. The tall grass is Miscanthus floridulus. The climber on the trellis is Clematis armandii. This particular plant joined the garden long before the pond featured above was constructed. Its initial home was in what is now the wildlife pond. The pond is relatively shallow at about a foot (30 cms) and is largely in the shade except for an hour or so at midday and the same in late afternoon. This (pre-digital scanned) photo shows the result of growing Thalia dealbata in the shade. 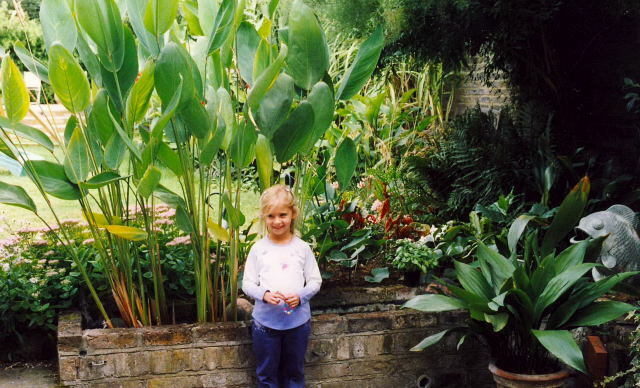 The child was just over four years old and could not be left out in the garden over winter. Grown in the shade the plant produced much larger leaves than it has ever produced in full sun. 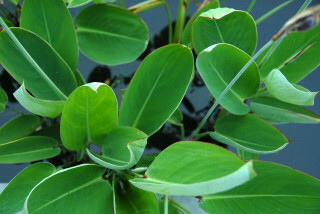 The original plant was purchased with one growing stem. It was planted in an 8 inch (20 cm) square pond basket in (at the time recommended) aquatic sludge. 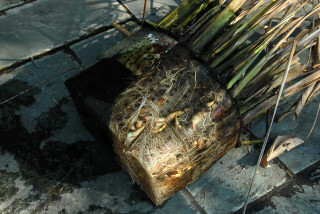 It did not take long before the plants rhizomes burst through the side of the basket and sent its roots to gorge on the sediment of the pond. 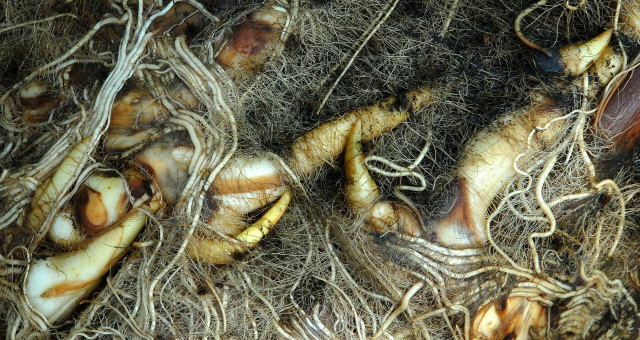 By the time it came to divide the plant, its roots covered the entire base of the pond. 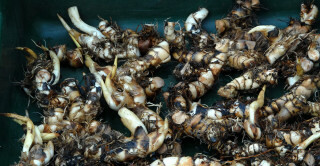 The following winter the plant was transferred to a newly created pond at the other end of the garden. 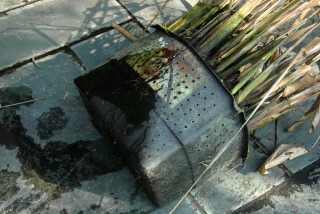 The new pond receives much more sun and it was felt that the Thalia dealbata would benefit from a sunnier location. 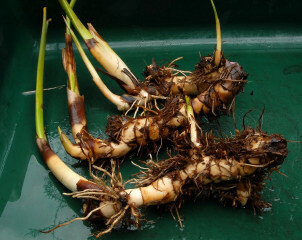 The Thalia rhizomes are quite similar in appearance to those of canna rhizomes, a characteristic that makes division simple. The plant was divided and re-planted in a couple of water cisterns that had been pre-drilled with holes. The planting medium was gravel. The first summers' growth was disappointing. Full sun and nutrient rich water (lots of fish) did not produce the growth that had been expected. The plants however produced significantly more flowers they ever did in the shadier location. The second years growth was more acceptable but the big leaves that were so seductive in the shadier location still did not materialise. The smaller leaved Thalia are still undoubtedly attractive but lack that certain something they had when grown in the shadier location. There were once again significantly more flowers so it was not just a case of panic induced flowering the previous year. By the end of the second year in the new pond it became clear that the plants would need to be divided once more. As luck would have it they were in fact able to get out after some considerable untangling. The healthy parts of the rhizomes (the nice pale sections) were separated from the older root stock to leave plenty of material for replanting. Large pots were chosen to prevent the soil drying out too soon. A smaller container would probably be sucked dry in a few days necessitating the need for constant watering. The containers are placed on the patio close to the pond, making the watering of the containers easy. Buckets or watering cans can be filled directly from the pond. This has the double bonus of watering the plants with chlorine free, nutrient rich pond water and allows the pond to undergo partial water changes. Generally the uptake of water by these plants is such that there has seldom been a problem with mosquitoes due to stagnant surface water. Occasionally during particularly wet periods the pots do fill up to their brims and mosquito larva appear. If this happens, stick a hose in the top of the pot and leave it running gently for a while. The mosquito larvae drift along with the current and when the water accelerates close to the edge it is too late for the mosquitoes to change direction. The flowers of Thalia dealbata occur in mid-summer in clusters at the tip of very tall, narrow stems. They are purple in colour and never really seem to quite open properly. Their most common suitor are wasps but tend not to be attracted in large enough quantities to spoil the afternoon. 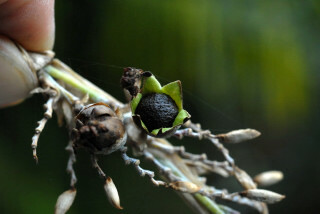 The seed pods ripen towards the end of summer and are very much at the mercy of wind and rain. 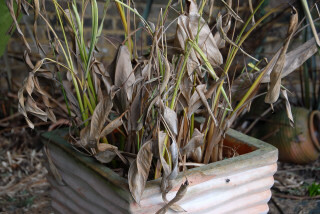 A sustained period of bad weather can strip the majority of developing Thalia dealbata seed pods from the stalk. 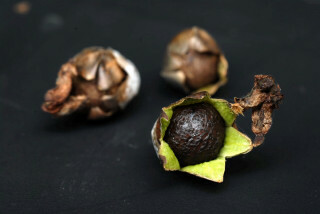 If they do make it through to ripe, the pods split open to reveal the seeds. 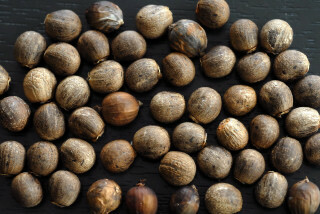 The seeds can be collected and saved for the unlikely event that you ever run out of rhizomes. 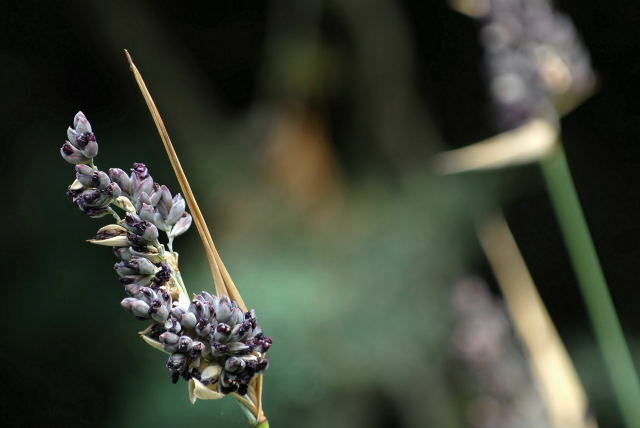 Being a perennial plant, your Thalia dealbata stems will gradually turn brown and shrivel up. These can then be cut right back and new stems will appear next spring.